The Great Ocean Conveyor is propelled by the sinking of cold, salty (and therefore denser) waters in the North Atlantic Ocean (blue arrows). That helps pull warm, salty Gulf Stream waters northward (red arrows). The Gulf Stream gives up heat to the atmosphere above the North Atlantic Ocean, and prevailing winds (large red arrows) carry the heat eastward to warm Europe. At the end of last summer’s melt season the Arctic ice cover was at its lowest extent since satellite observations began nearly 30 years ago. Shockingly, this is roughly 40% lower than the previous minimum, measured just two years ago. While there has been a steady decline in ice cover over the satellite record, some scientists believe that the shrinkage will continue to accelerate, leaving an ice-free summertime Arctic Ocean in a matter of decades. Although the vanishing of the ice has garnered headlines, other high-latitude manifestations of global warming have also been observed and/or predicted, including more storms (hence more precipitation), more river run-off, increased glacier melt, and fresher input into the Arctic from the Pacific Ocean. All of these changes, in addition to the vanishing pack-ice, consistently point to an increasing discharge of freshwater from the Arctic to the Atlantic Ocean. Consequently, there is widespread concern about the impact of this increased freshwater on the meridional overturning circulation (MOC) of the Atlantic. The MOC helps regulate our climate by bringing warm, shallow water poleward (primarily via the Gulf Stream system), which then cools and sinks at high latitudes – ultimately returning to the equator as a deep flow. The worry is that, if the open North Atlantic gets flooded with freshwater, this will inhibit the sinking (freshwater will freeze before becoming dense enough to sink) and dampen or shut down the MOC. Such an alteration of the MOC would have global consequences on our climate. However, roughly half of the freshwater that exits the Arctic Ocean does so in a narrow boundary current known as the East Greenland Current (the other half exits through the Canadian Arctic Archipelago). Hence, in order for the freshwater to spread into the interior basin and impact the MOC, it must first be transferred off the Greenland shelf. Presently, we don’t know how this will happen, how quickly it will occur, or what quantity of water will be moved seaward. In an effort to investigate this, we deployed an array (group) of instrumentation in Fall 2007 in a line across the edge of the East Greenland shelf, at the spot where the outflowing Arctic water first meets the open Atlantic. Here a sharp front forms between the cold, fresh Arctic water and the warm, salty Gulf Stream water. While it has been known for decades that this front is "leaky" (meaning that water masses cross the front boundary), the mechanisms responsible for the exchange of water remain unknown. This is largely because these processes happen at very small spatial scales (for oceanographers, very small means roughly 20 kilometers!) Hence, our array was designed as a "picket fence" bracketing the East Greenland Current, with closely spaced (~10 kilometers apart) moorings extending through the water column. We believe that the transfer of water happens primarily for two reasons: from inherent instability of the front (i.e., the front regularly contorts and sheds swirls of water), and because wind forces the water offshore during the winter storm season. This portion of the East Greenland Current lies along the North Atlantic storm track and is thus subject to fierce winds. 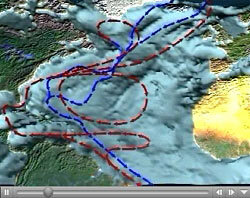 Not surprisingly, such a venture to measure the East Greenland current is not without risk. The flow of the current can reach extreme speeds that can knock down moorings. 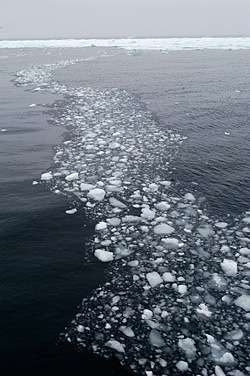 Icebergs frequent the area in spring and summer, and deep-sea trawling occurs in this region. As we set the moorings in September 2007 among a multitude of icebergs, we tried to remain optimistic about the prospect of seeing all of our gear again. However, understanding how an increased Arctic hydrological cycle will impact the North Atlantic requires that such risks be taken. Mother Nature willing, a successful outcome will provide us with some important clues for sorting out the climate change puzzle.